Trump’s JCPOA withdrawal did not lead to war with Iran, as many critics predicted. Instead, Iran is far more isolated than it was when President Trump assumed office. The United States has worked to unite its Middle East allies, especially Israel and Saudi Arabia, against Iran and, in Warsaw this month, will co-chair an international conference with Poland on the threat from Iran. Iran’s economy is under unprecedented pressure thanks to reimposed U.S. sanctions, especially oil sanctions, with negative 1.5 percent growth in 2018 and an expected negative 3.6 percent growth in 2019. Iran’s current year-on-year inflation rate through last month was 40 percent. Some Trump critics predicted that any effort by the president to reimpose U.S. sanctions lifted by the JCPOA would have little effect, since other parties to the agreement — in particular the EU, Germany, France, and the U.K. — would not follow suit. But numerous European companies have resisted pressure from their governments to defy reimposed U.S. sanctions. On January 31, European leaders announced a special finance facility to help European firms skirt U.S. sanctions on Iran, but that initiative is months behind schedule and few experts believe it will work. Instead, as a result of reimposed U.S. sanctions, European airlines Air France, British Airways, and KLM ended service to Iran last year. European companies Total, Siemens, and Volkswagen also withdrew from Iran, along with U.S. companies GE, Boeing, and Honeywell and the Russian oil firm Lukoil. In November, Germany’s Bundesbank changed its rules so it could reject an Iranian request to withdraw 300 million euros from Hamburg-based trade bank Europäische-Iranische Handelsbank, to protect the central bank’s relationships with institutions in “third countries.” That is, the United States. Before the U.S. withdrawal, JCPOA critics made strong arguments about the accord’s weaknesses, especially Iran’s refusal to allow International Atomic Energy Agency (IAEA) inspectors access to military sites. The lone exception is the Parchin military base, self-inspected by Iranians. There the IAEA obtained evidence of covert nuclear-weapons work. There were other credible reports of Iranian cheating before the U.S. withdrawal, including several from German intelligence agencies. Senators Ted Cruz, Tom Cotton, Marco Rubio, and David Perdue raised Iranian noncompliance and cheating on the JCPOA in a July 2017 letter to Secretary of State Rex Tillerson. JCPOA supporters rejected those criticisms, noting that the IAEA repeatedly declared Iran to be in compliance with the nuclear agreement. However, they refused to admit that the IAEA reached its compliance findings by claiming that Iranian violations were not “material breaches” and by not asking to inspect Iranian military facilities (which Tehran has declared off limits) even though they are the likely locations of covert nuclear-weapons work. A disturbing report concerning the Arak reactor arose late last month when Ali Akbar Salehi, the head of Iran’s nuclear agency, claimed that Iran did violate the JCPOA by disabling the reactor and filling it with cement, and that Iran secretly acquired banned equipment to keep the reactor functional. If true, this would mean Iran fooled the JCPOA parties and IAEA inspectors on a major compliance issue. The IAEA has not commented publicly on the matter. At last week’s worldwide-threat briefing to the Senate Intelligence Committee, the U.S. intelligence community reported that Iran is technically complying with the JCPOA, a finding that reflects both the IC’s history of liberal bias on assessments of weapons of mass destruction (as seen after the Iraq War as well) and the failure of the Trump administration to take steps to clean out key intelligence offices that were stacked with analysts who favored Obama-administration policies during the last administration. At National Review Online in 2015, I wrote about a CIA official who tried to pressure me to support the agency’s pro-Obama line on Iran’s nuclear program even though I had left the CIA and was working for the House Intelligence Committee staff. JCPOA backers also prefer not to discuss the fact that Tehran can advance its nuclear-weapons program without violating the agreement, since the accord allows Iran to improve its capability to make nuclear-weapons fuel — that its, to enrich uranium with over 5,000 centrifuges and develop advanced centrifuges. Moreover, although the agreement required Iran to disable its Arak heavy-water reactor (a source of plutonium), which was under construction, under the JCPOA a new heavy-water reactor will be built that will be capable of producing one-fourth of a weapon’s worth of plutonium per year. 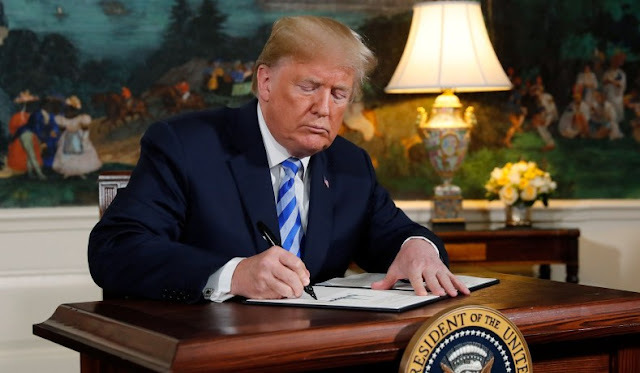 That arrangement will enable Iran not only to gain knowledge on how to build and operate heavy-water reactors but also to have access to plutonium, the ideal fuel for nuclear weapons. Other new evidence of the JCPOA’s weakness and Iranian cheating includes the Iran “nuclear archive,” a huge cache of Iranian documents on its nuclear-weapons program. Stolen by Israeli intelligence in early 2018, they show that in 2015, in a declaration of its nuclear-weapons-related activities (the declaration was a prerequisite for Iran to receive sanctions relief under the JCPOA), Iran lied to the IAEA. The documents indicate that Iran was planning to construct five nuclear-missile warheads and constructed a secret underground tunnel complex at the Parchin military base, where it was developing nuclear-weapon components. At the U.N. General Assembly in September 2018, Netanyahu said that the nuclear-archive documents also revealed the existence of a secret atomic warehouse, in the Turquzabad district of Tehran, that may have contained 300 tons of equipment and 15 kilograms of radioactive material. Netanyahu said that Iran began to empty out the Tehran nuclear warehouse shortly after Israel’s acquisition of the archive documents went public in April 2018. JCPOA supporters assert that IAEA verification of the nuclear accord is thorough, but the IAEA declined to ask Iran for access to inspect this site, even though Israel had quietly informed IAEA officials about it. Not surprisingly, U.S. intelligence officials also ignored this development during last week’s worldwide-threat briefing, probably because it contradicts their corporate line that Iran is complying with the JCPOA. Iranian behavior has been so bad over the last year that Europe, whose leaders have condemned Trump’s decision to withdraw from the JCPOA and reimpose sanctions, has been forced to consider placing new sanctions on Iran. On January 9, in response to a wave of terrorist attacks in Europe by Iranian assassination squads, the European Union imposed its first sanctions against Iran since the JCPOA was agreed to in 2015. The new sanctions were an acknowledgment by Europe that the JCPOA failed to achieve one of its primary purposes: ending Iran’s malign behavior. On January 25, French officials spoke of the possibility of imposing new sanctions against Iran in response to its recent tests of nuclear-capable ballistic missiles. Other EU countries reportedly are considering similar sanctions. Iran unveiled its latest missile — the Hoveizeh cruise missile, with a range of 1,300 kilometers — on February 2. Not only does the JCPOA lack provisions for limiting Iran’s missile program, but during the talks that led to the nuclear pact, previous U.N. missile sanctions on Iran were weakened. the short to medium term, because of resistance by Iranian leaders and the current refusal of other JCPOA parties to abandon the agreement, reimposed U.S. sanctions against Iran, to limit the revenues it can spend on belligerent activities and to deny Tehran access to nuclear and missile technology, are an important short-term goal, already showing success, that will bolster regional and international security. Getting a comprehensive agreement on the threat from Iran with full buy-in from America’s regional allies is the Trump administration’s ultimate goal. While this may be too far a reach in the short to medium term, because of resistance by Iranian leaders and the current refusal of other JCPOA parties to abandon the agreement, reimposed U.S. sanctions against Iran, to limit the revenues it can spend on belligerent activities and to deny Tehran access to nuclear and missile technology, are an important short-term goal, already showing success, that will bolster regional and international security. Events of the last nine months more than vindicate President Trump’s controversial decision to withdraw from the Iran nuclear deal. Making this decision despite strong condemnations of it by the foreign-policy establishment, the press, Democrats, and European leaders and despite resistance from the U.S. intelligence community and some of his former cabinet members was an act of presidential leadership that now allows the United States and the world to focus on the full set of threats posed by Iran without being handcuffed by President Obama’s deeply flawed Iran nuclear agreement.